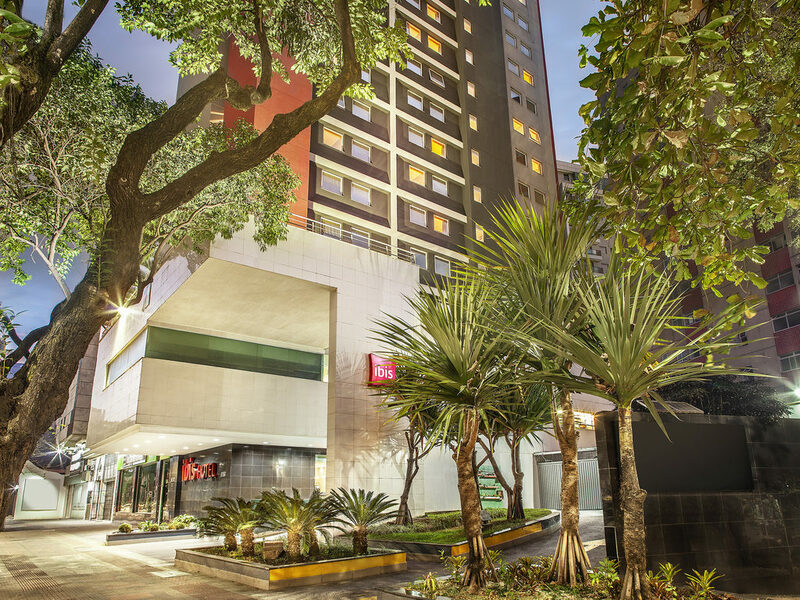 Located in the Savassi region, one of the most prestigious regions of the mining capital, Belo Horizonte, 26.1 miles from the airport and 109 yards from Pátio Savassi shopping center, the ibis BH Savassi is set in the business, commercial and entertainment district. Distance between the main cities and their attractions: a) 59 miles from Ouro Preto b) 62.1 miles from Serra do Cipó National Park c) 15.5 miles from Sabará d) 116.8 miles from Tiradentes. The hotel has free WIFI Internet access. Located in the Savassi region with easy access to the city's main hot spots, the ibis BH Savassi offers the most in terms of the service-quality-price ratio. Situated 109 yards from the Pátio Savassi shopping center and 26.1 miles from Confins airport. Economy hotel with 208 apartments, 220/240 V voltage, air conditioning, telephone, cable LCD TV, minibar, automatic alarm and wake-up call service, free Wi-Fi Internet in the apartments and private bathroom with hairdryers. Open for dinner with a delicious buffet serving salads, hot dishes and dessert. Monday to Thursday, 7pm to 10:30pm, excluding public holidays. It was just one night, but I had everything I needed. Good Breakfast available, good bar and very comfy room. Attention points: quantity of dishes and cups for the breakfast wasn't enough. To much people in line to be attended at help desk. I had to change apartment to get WiFi signal. Apartment cleanliness wasn't good enough. Stay was just ok. But could be better. The pillows had the smell of other people’s hair and the bathroom had actually hair everywhere, even stuck on the shower walls. Sheets are very small and doesn’t stay in place. Terrible mattress! AND NO SOAP??? Absurd never again!!! It was a short stay and for the few hours I spent it was ok. I primarily chose this hotel for the location. As always, stay in Accord's hotels is a pleasure because the guest already knows he'll find an affordable, clean and pleasant room. Nice place to stay few nights, lots of restaurants, pubs and a shopping center near to the hotel. The barman was great - such a big smile makes feel you welcome from the very beginning on! The hotel is however very basic if you compare it to other Ibis properties and certainly not confortable. Although the location is good, it's not a hotel I will rebook in the future. The hotel is conveniently located. The rooms are modern and well-equipped. The bad mattress could be a bit softer. Nice and friendly service, clean. Good neighborhood. Like the place. Restaurant at night was not the best option.